Ice River Springs, a Canadian manufacturer of PET plastic containers with multiple facilities across North America. 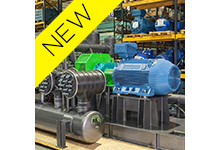 Ice River Springs made the decision to retrofit their Halton Hills high pressure bottling line, including taking on a compressor upgrade. Since CRU AIR + GAS was brought in after management had decided to proceed with the project, our team strongly recommended that a Save On Energy Audit Funding Project was conducted before any retrofit decisions were finalized. Doing so would reveal what the current energy consumption footprint of the existing system was and what it would be with the new equipment through an AIRMASTER+ simulation. CRU AIR + GAS installed two VERIS True RMS power meters – one on each compressor. A CDI flowmeter was installed on the common header pipe to the plant to measure compressed air flow. Pressure transducers were installed before and after air treatment and at the end of the line to monitor plant pressure gradient. After the system baseline was established the new compressor energy profile was entered into AIRMASTER+ along with the new system consumption parameters. An energy efficient system simulation was done and new energy efficient case numbers were produced. Halton Hills Hydro had their 3rd party reviewer scrutinize all submitted data and the baseline and energy efficient cases were verified as accurate. 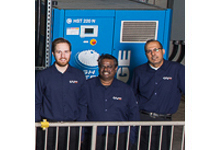 CRU AIR + GAS found that there were staggering consumption reductions that were possible with the retrofit project and our team carried out a simulation with the new compressor that was to be installed. A detailed RETROFIT project was formulated and submitted and, with the help of Halton Hills Hydro, the project was determined to bring a large incentive and reduction in the Halton Hills facility’s carbon footprint. 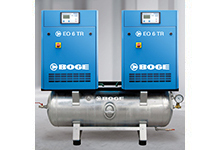 A new, oil-free, reciprocating air compressor. A new high pressure bottling system line. System pressure was lowered to the minimum required pressure that would allow production to run without issues or downtime.